Origin: In its pure form, this snake is found from coastal North Carolina to southeastern Georgia and over most of the Florida peninsula. In the Florida Everglades a very similar snake is brilliant orange and often is known as the Everglades rat snake, E. o. rossalleni. Habitat: Yellow rat snakes are arboreal, often found high in cypress and oak trees in search of prey. They usually are found near water but also can be common near homes and barns. The taxonomy of the American rat snakes is currently being debated and changes often. Some workers do not recognize the subspecies quadrivittata as distinct from the main species, and some prefer to use the name Elaphe alleghaniensis for eastern U.S. rat snakes, using obsolete for a species from west of the Mississippi River. Recently workers have suggested that American rat snakes should be placed in the genus Pantherophis or even combined with the genus Pituophis (normally containing the pine snakes). This is a big snake that needs a large, tall terrarium at least 4 feet long and preferably 3 or 4 feet high. There should be many climbing branches and resting surfaces well above the floor. Almost any substrate can be used, but it should not become too moist. 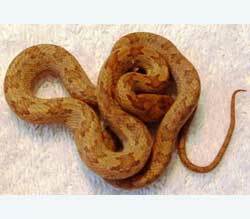 Very humid keeping conditions can lead to dangerous bacterial blister disease in these snakes. Provide a shallow bowl of water that will be used for soaking, and change it regularly. Yellow rat snakes are among the easiest snakes to feed, as they will take rodents and birds of any appropriate size. Large adults will even take rats, while hatchlings take pinky mice. Wild-caught specimens almost certainly will have intestinal parasites and should be wormed.